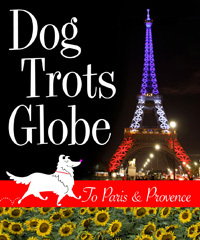 Cyber Monday special on the hardcover edition of Dog Trots Globe. Just $9.95 for the hardcover edition at OIC Books and Amazon. That's a stocking stuffer price! Don't miss this special opportunity to pick up multiple copies to kick off your holiday gift shopping for the dog lovers and Francophiles on your list. Hurry! This barking good price is good only on Cyber Monday. Read our Talking Dogs full review of Dog Trots Globe.